How do I start my career in the Video Industry? There are many ways to begin a career in the video industry. You can begin at low level crew, apprenticeship and production office positions and work your way up. You can use your credentials to earn a technical video position at a local business or production company. You can develop a network of connections to find freelance, contract or for-hire work. You may enter video projects into film and video festivals and contests. You could research and apply for a wide range of video and/or arts grants. Or you can go into business for yourself as an Independent Video Professional – start your own business and work on a variety of project types with a diverse body of clientele. For all of these career paths, it is important to have a resume with a full compliment of technical skills: in camera operation, audio capture, screenwriting, post-production software and graphic communication software. In addition, a video portfolio or reel that demonstrates your abilities is essential. The best and most impressive way to get work in the video industry is to show a professional and creative body of finished projects on a video reel/portfolio that shows both technical proficiency and creativity over a diverse body of work. In the Video Production Program, we provide the framework for a number of projects that can be included on a Video Reel or Portfolio to be used in job searches, applications and client referral. What kind of jobs can I get with a degree in Video Production? Because the demand for video content is extremely high right now and the cost of production so low, there is a lot of opportunity for Independent Video Professionals who can see a project from concept to completion individually or with a small crew and budget. Freelance and Contract Video Work requires self-motivation and an entrepreneurial spirit, but is a highly rewarding and well-paid avenue with many opportunities for adventuresome graduates of the Video Production Program. Other, more traditional jobs are available in Video Production in more specific areas of the Production Process. There are jobs for: Video Editors, Assistant Editors, Post-Production Supervisors, Animators, Motion Graphic Designers, Writers, Producers, Video Directors, Documentarians, Cinematographers, Camera Operators, Camera Assistants, Production Assistants, Location Scouts, Production Designers, Producers, Sound Designers, Sound Mixers, Audio Technicians, Video Technicians, Multimedia Technicians, Newsgatherers, and Videographers. At NTC we try to connect our students with local and national industry professionals so that they have opportunities to work on ‘real world’ projects both at school and in the industry during and after their academic studies at NTC through mentorships, job postings, internships and a number of work-study video projects for the college. There is an increasing demand for video content both online and through other media outlets and a need for video professionals to create high quality content on a budget. The Independent Video Professional is a freelancer, entrepreneur, videographer or independent contractor who is trained to create professional video content from start to finish using a minimum of resources on a project by project basis. This is a lucrative and rewarding career path for someone who is self-motivated, creative and passionate about all aspects of video production. 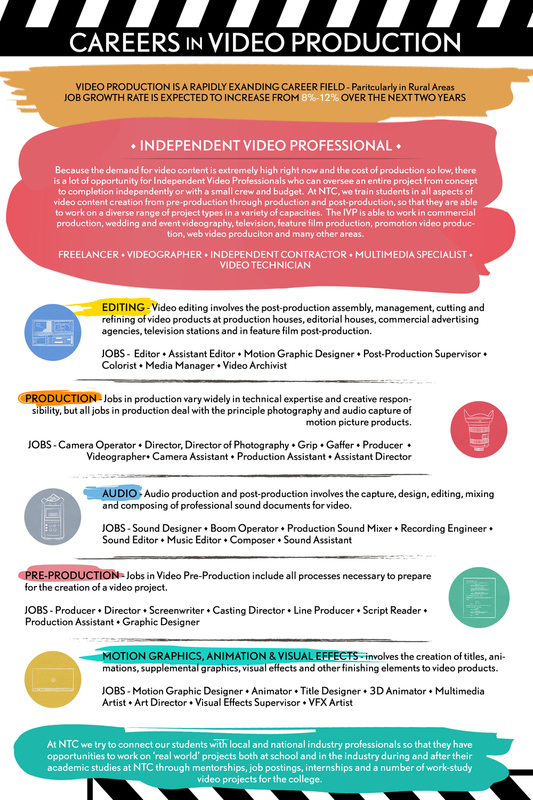 The IVP will work on a variety of project types from commercial projects, promotional video projects, documentaries, web-videos, branding content, wedding & event videography, news-gathering, and motion graphic design in a number of roles (detailed below) including: director, producer, cinematographer, camera operator, editor, sound designer and motion graphic designer. The Independent Video Professional is responsible for marketing his or her own skills and finding clients, projects, funding and/or contract work. Video Producers are responsible for developing video content from the beginning and overseeing the production and post-production of video projects to completion. The Producer helps raise funding for video projects, communicates with current and potential clients, hires key creative resources, creates schedules and budgets, secures equipment and locations, manages production crews, and supervises the post-production of video content for delivery to the client or other distribution modes. The Video Director is the key creative resource on a video project. The Video Director is responsible for developing scripts and screenplays, creating shot lists and storyboards, organizing and communicating with creative and technical personnel, establishing and executing a unified audio and visual design for video projects, directing actors, camera, lighting, sound and other production crew, overseeing the post-production editing, sound design, color timing, graphics, mixing and distribution of video projects. The Video Editor is the key creative and technical personnel in the post-production of a video project. The Video Editor is responsible for importing and organizing digital media, assembling, cutting and arranging video content, managing post-production projects, digitally manipulating audio and video elements, presenting cuts to directors, producers and clients, working with post-production personnel to achieve a finished video product and exporting video to distribution formats. The Sound Designer has a number of roles depending on the size and budget of a production, but he or she may be responsible for the design, creation, capture/recording, editing and mixing of the audio components of a video project. The Sound Designer often works with production and post-production resources to ensure that audio is consistent, professional and effective through every stage of the process. The Cinematographer is responsible for overseeing the camera department, lighting department and overall visual design of a video project. Depending on the size and budget of the video project, the cinematographer may be responsible for securing equipment, operating the camera (and related equipment), designing the shot (composition, framing, color, etc. ), lighting the scene and managing a variety of photography personnel. The Camera Operator is responsible for maintaining and operating camera and lens equipment on a video shoot. The Camera Operator may be the Cinematographer or other Camera Assistant. The Camera Operator may be responsible for running the camera, lighting, file management, camera support equipment and lenses. The Motion Graphic Designer is a key member of the post-production team who is responsible for designing, creating and implementing animated graphics and text material for video products. The Motion Graphic Designer may create titles, supplemental graphics, animations, color and image effects for a video project. The Visual Effects Artist is responsible for designing, creating and implementing a variety of visual fx for the post-production finishing of video projects. The Visual Effects artist may be responsible for keying, compositing, animation, title design, image effects, 3D animation and effects.